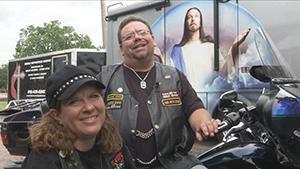 Photo right: Eddie Gill and his wife Patty are the founders of the United Methodist Motorcycle Association. In July of 2015, I was searching the internet to see if I could find any other United Methodist motorcycle riders. I ran across a newly organized group in Tulsa, Oklahoma called The United Methodist Motorcycle Association. I sent an email to the founder and organizer, Eddie Gill, asking him if we could piggyback here in Mississippi on what they had begun in Oklahoma. In August I received a call from Gill and with his blessing. I sent in my membership application. Gill shared with me that the UMMA was at that time in two annual conferences and interest was being generated in a few more. With my membership, Mississippi was added to that number. In December of 2015, I spoke with Gill again and he shared with me that the group had grown to cover eight annual conferences. In March this year Gill and his wife Patty were traveling from Daytona, Florida and asked if they could park their motorhome in our church parking lot overnight and attend church with us on Palm Sunday. It was such a pleasure to meet this couple and hear how God has been working through the ministry of The United Methodist Motorcycle Association. They have had the opportunity to share the ministry and theology of The United Methodist Church with a diverse group of motorcycle riders who may have rarely heard a word of grace and welcome from the local church. Gill shared with me on Palm Sunday that the association now had members in 16 annual conferences. I invite you to check out the website for The United Methodist Motorcycle Association and welcome all riders and non-riders. Clergy or laity to check out our exhibit booth at the 2016 annual conference session in Jackson to learn more about how God is using this group to reach people for Jesus Christ as today's modern "iron horse" circuit riders.